This is an autobiographical book by one of Continuum's bestselling authors, Eric James, full of insight and wit. 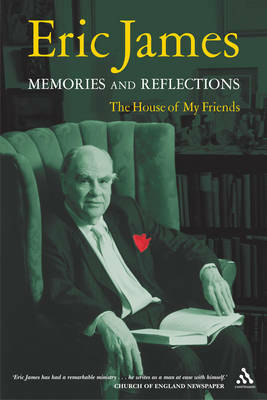 "The House of Friends", the self-portrait of a wise and much-loved pastor, is the nearest Eric James will get to an autobiography. He left school in Dagenham, Essex, at fourteen, when the Second World War broke out, and worked for seven years at a riverside wharf on the Thames where the Globe Theatre now stands. After ordination, he became chaplain of Trinity College, Cambridge, and thereby became associated with some of the most famous and influential clerics of his generation: Mervyn Stockwood, John Robinson (author of the bestseller "Honest to God"), Robert Runcie and Trevor Huddleston. James was made chaplain to H.M. the Queen in 1984 and was preacher to Gray's Inn from 1978-97, as well as Director of Christian Action from 1979-90 and one of the people who inspired "Faith in the City". The roll call of people that Eric James writes about, always with wit and perception, is astounding. He has broadcast regularly to millions of listeners on the BBC's "Thought for the Day" programme, and his strong social conscience breathes through the pages of this book. Eric James is the author of a dozen other books including the highly praised biography of Bishop John A.T. Robinson.